While no one is using the word “cancelled,” it’s now official. The Last Ship TV show on TNT will end with its upcoming fifth season. Beginning in September of 2016, when TNT issued a (way) early season five renewal, it seemed likely The Last Ship would end with season five. Then, in September of 2017, when production wrapped, one of the cast referred to said wrap as a “series wrap” rather than a “season wrap,” which made cancellation, i.e. the show’s end, seem all but a done deal. Now, Turner Chief Creative Officer and President of TNT and TBS Kevin Reilly has confirmed the fifth season will be the series’ last, at today’s Upfront presentation advertisers. A TNT post-apocalyptic drama The Last Ship stars Eric Dane, Bridget Regan, Adam Baldwin, Charles Parnell, Travis Van Winkle, Marissa Neitling, Christina Elmore, Jocko Sims, Bren Foster, and Kevin Michael Martin. The action centers on the crew of the USS Nathan James, which must try to find a cure for a deadly virus that has wiped out most of the world’s population and subsequently infects food crops. The fourth season of The Last Ship averaged a 0.31 rating in the 18-49 demographic and 1.55 million viewers. Compared to season three, it was down by 38% and down by 30%, respectively. Find out how The Last Ship stacks up against other TNT TV shows. What do you think? 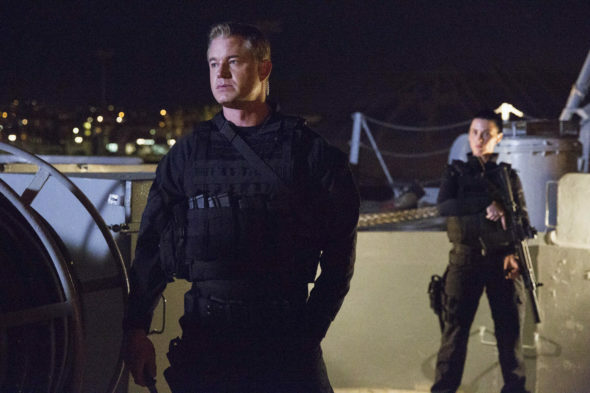 Are you a fan of The Last Ship TV series? Do you think the fifth season is a good time to end it? If it were up to you, would The Last Ship be cancelled or renewed for season six on TNT? More about: The Last Ship, The Last Ship: canceled or renewed?, The Last Ship: ratings, TNT TV shows: canceled or renewed? I watched every episode of The Last Ship and found it to be a very well done show from top to bottom. The characters, story line, drama and action were superb. There aren’t a lot of shows that literally keep you on the edge of your seat as The Last Ship was able to do. I was sad to see it cancelled. Although a reboot would be welcome in my household, I understand the financial implications of a .31 rating and realize that is impossible at this point. EXCELLENT! The best thing we can all do, is notify sponsors on TNT that their products will not be purchased or their services rendered because of this cancel. When TNT gets the word that their sponsors will be leaving, that could postpone a cancel of the show. This procedure has worked before, in saving potentially cancelled shows. WTF with the 18-49 demographics. The people that really appreciate this type of programming and are more apt to spend money on the things that are advertised, are 50 and up . . . I watched this show The Last Ship o watched it on 3 am or what ever. I can’t believe you are taking the show out. I is a great show. Put a new 6 episode. Absolutely terrific show! Great adventures, highly realistic sfx. Please DO NOT cancel. This program “The Last Ship” is #1 in my priority of choices. Of course that means my “vote” is that it continues beyond what is being billed as its final year. I know I am only one person but I am hopeful that viewers who feel similarly will express their feelings. I do not understand why good shows like The Last Ship and dozens of others over the years have been axed and keep the scum soap operas on sad just sad !!!!!!!!! PLEASE KEEP THIS SHOW ON FOR THE FOLKS THAT LOVE IT ?????? I love the show, but the concept cannot go on being renewed without some farfetched ideas. The whole original concept was great, but once the virus was eradicated and the president installed, then the show direction was muddled. great show,unfortunatly Eric Dane’s depature means the show wont get a 6th season.Good way to end with a bang instead of a whimper.kudos to the writers and all the actors of the show,i will miss this one a lot. We enjoy The Last Ship very much–no other show like it. We would love to see a season 6 and beyond. Another thought provoking and well wrutten show with a great cast. Please don’t cancel. Please don’t cancel this show, I have been a fan since day one. I love the characters, the writing has been fantastic. It is a one of kind show. Love this show. Great cast (even tho some of my favorites were killed off. Please don’t cancel.